Midtown Corridor Improvements, Denali Street Area | Benson Blvd. to Tudor Rd. Benson Blvd. to Tudor Rd. The Draft Design Study Report (DSR) for the Midtown Corridor Improvements, Denali Street Area: Benson Blvd to Tudor Rd, is available for public and agency review. The DSR documents the analysis of the existing issues and recommends solutions to expand transportation opportunities, promote livability and economic development, and enhance connectivity in Midtown Anchorage. To view the plan documents and all Draft DSR appendices, please go to the Documents Page. If you have questions or comments, please contact a member of the project team. Thank you for your continued support of the Midtown Corridor Improvements project. Thank you to those who attended the second open house on Thursday, April 12th. If you missed the open house, you can still review and comment the draft alternatives for Denali Street and 36th Avenue, including intersection treatments. The information presented at the open house is available below and on the documents page. Please review the alternatives and let us know which you prefer. Fact Sheet: page two has a quick-guide and comparison of the alternatives! Please join us for the second public open house to review and comment on the draft complete street alternatives for improving opportunities for pedestrian, bicycle, and mobility for users of all ages and abilities on Denali Street and 36th Avenue. The draft alternatives presented at the open house will be available for review here following the public meeting. If you can’t attend the open house, you can still provide your input by email or calling a member of the project team. Thank you for your continued interest and support to improve the Midtown Corridor for all users. The Final Concept Report for the Midtown Corridor Improvements is available for review. To view the full report and appendices, please see the Documents Page. The Concept Report went before the Planning & Zoning Commission on December 4th as an information item, where commissioners expressed support for the project. Minutes from the PZC meeting are available for your review. Thank you for your continued interest in the Midtown Corridor Improvements project. Make sure to stop by the Anchorage Transportation Fair on February 8th to support this project and learn more about Anchorage area transportation initiatives! Visit us at Anchorage Transportation Fair! Ride the bus? Routes 10, 20, or 55 will get you there. Parking will be free at the main lot, in front of the building (click here for a parking map). Bike parking available near the front doors. The Anchorage Transportation Fair is a one-stop open house style event to provide you with information on projects happening throughout the Anchorage area. You will be able to visit with project teams, view project and plan features and get your questions about the projects answered. The Concept Report for the Midtown Corridor Improvements is available for review! To review the full report and it’s appendices, please see the Documents Page. As part of the Municipality’s Context Sensitive Solutions for Transportation Projects, the Concept Report is reviewed as an informational item by the Planning & Zoning Commission. The informational review will be on December 4th, 2017 at the Loussac Public Library beginning at 6:30 PM. Thank you for your continued interest in the Midtown Corridor Improvements project and continue to check for more opportunities to participate. Thank you for attending the first public open house on Thursday, October 5th and helping to identify issues and opportunities for the corridor. If you missed the open house, you can review the materials presented by following the links below, or on the Public Involvement page. Let us know what issues you have experienced in the Midtown Corridor, Denali Street area by contacting a member of the project team. Please join us for the first public open house to identify issues and opportunities for pedestrian, bicycle, and mobility for users of all ages and abilities on Denali Street and 36th Avenue. If you cannot attend the first open house, you can still participate by emailing or calling us to share your view on current non-motorized issues, access and linkages, comfort, image, and use of the Midtown Corridor. Surveyors with R&M Consultants, Inc. will be in the project corridor intermittently between Monday, June 19th and Wednesday, June 28th. Kinney Engineering will also have staff in the area collecting traffic counts, turning movement and sight distance data from June 20th through June 30th. Please drive carefully. If you have any questions, please contact a member of the project team. The Municipality of Anchorage (MOA), Project Management and Engineering Department (PM&E) is beginning a transportation project to evaluate complete street opportunities for Denali Street and 36th Avenue. Complete Streets are streets for everyone. Complete streets are inclusive of all users including motor vehicles, pedestrians, bicyclists, and transit riders of all ages and abilities. The Midtown Corridor Improvements, Denali Street Area project is working to expand transportation opportunities, promote livability, and enhance connectivity in Midtown Anchorage by applying a complete streets strategy. The Department of Transportation and Public Facilities (DOT&PF) is conducting a Midtown Congestion Relief Planning and Environmental Linkages (PEL) Study. 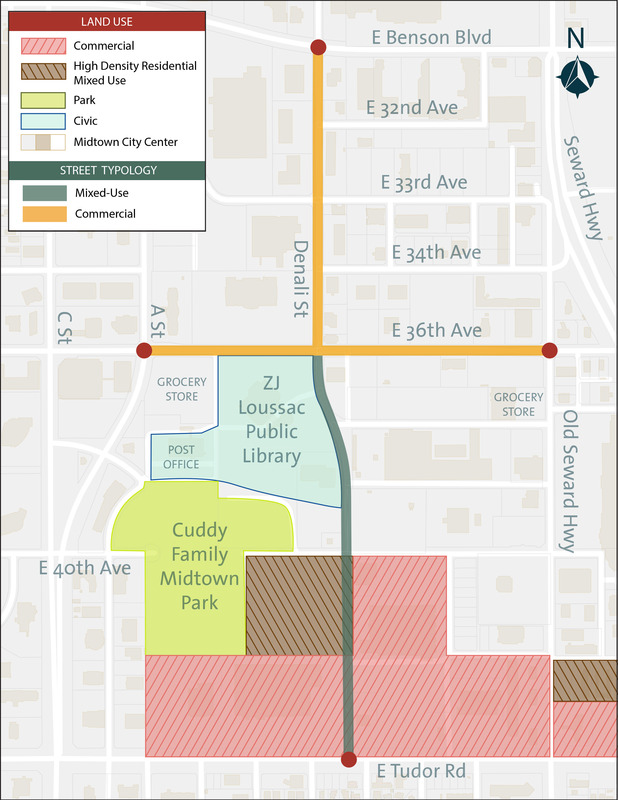 The Midtown Congestion Relief is focused on the area surrounding the Seward Highway from Tudor Road interchange to approximately 20th Avenue. The PEL Study will conduct a traffic study to evaluate inter-related issues surrounding the closely-spaced, signalized intersections in Midtown Anchorage and determine a list of priority project to improve Midtown congestion.